In our lab we are interested in the use and development of novel physical techniques to study biomolecular interactions including proteins, DNA and RNA at the level of single molecules. The advantages of single-molecule detection are many, apart from the fascination of looking at individual biomolecules at work, single-molecule techniques can measure intermediates and follow time-dependent pathways of chemical reactions and folding mechanisms that are difficult or impossible to synchronize at the ensemble level. Thus, single-molecule fluorescence techniques, in combination with advanced microscopes and manipulation methods, provide novel insights into how molecules and systems behave, having the advantage that spatial and temporal averaging is avoided, temporal synchronisation is not necessary and novel phenomena, which otherwise are averaged and remain hidden in ensembles, may be discovered. 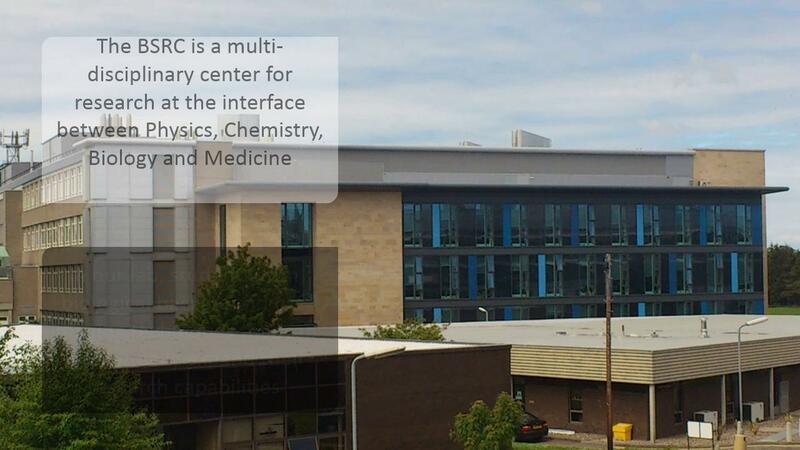 and the Biomedical Science Research Complex (School of Biology) (http://www.st-andrews.ac.uk/bsrc/). In our lab, students with physics and chemistry backgrounds have opportunities to apply their expertise in instrumentation, synthesis and analysis to interesting biological problems; and students with biological background are exposed to state-of-the-art or emerging physical technologies that can substantially expand their biological research capabilities. Currently, we have two home-built single-molecule prism-type total internal reflection (TIR) microscopes to measure dynamics from submilliseconds to seconds; a single-molecule fluorescence correlation spectroscopy (FCS) microscope for faster dynamics and ensemble steady-state fluorescence, nanosecond time-resolved (TCSPC) spectroscopy and molecular biology facilities. We are currently developing single-molecule fluorescence with spectrograph capabilties for spectral information on individual molecules and further combining this with optical force manipulation methods. Our work 'Real-time observation of conformational switching in single conjugated polymer chains' in collaboration with Prof. Samuel (St Andrews) and Prof. Gui Bazan (Univ. California Santa Barbara) has been accepted in Science Advances. Thanks to everyone involved. Our work on a new framework to classify RNA-ligand interaction models has just been accepted in PCCP. Our paper in collaboration with White's lab on a single-strand DNA binding protein with high affinity for single-stranded RNA has just been accepted in Thermophiles. Many thanks to everybody involved.